This week’s guest blog comes from Hallam Internet – an experienced and established digital marketing agency. Ben Wood, Head of Digital, at Hallam Internet looks at International Search Engine Optimisation (SEO), and offers some top tips and advice for UK businesses hoping to use the internet to increase visibility internationally. Hallam Internet is a digital marketing agency, based in the East Midlands who work with a number of companies who are finding success abroad through international digital marketing. They are experts in international search engine optimisation. For more guidance on this topic, you can also read our article on using your website to broaden your international appeal. If your business is exporting or selling products or services outside of the United Kingdom, close attention will need to be paid to the structure of your website so search engines abroad can market your product or services correctly. So, international SEO is essentially the process of setting up your website so that foreign search engines can easily identify which countries you want to reach and which language to use. You’ll need to make your site content is relevant for users in your target international areas/languages, not forgetting using the right time zones and currencies. International SEO is vital for any UK businesses who trade overseas, or hope to expand into new international markets, this is the best way to gain awareness of your brand, products and services on a global scale. It gives UK businesses the power to drive and increase traffic from other countries and foreign language speakers to your website, increasing conversions. Essentially, making your website global can help you grow your reach to an international audience. If you are looking at your site traffic and notice that many of your visitors are either coming from other countries or speak other languages, then it may be time to focus on international SEO. Your business has a large worldwide customer base. You’re looking to expand your reach into new international markets. May seem obvious, but If you are an international business with locations in different countries or have partners abroad. Your customers speak languages other than English. Basically, if you are a business that is targeting multiple countries and are looking to export and expand globally. 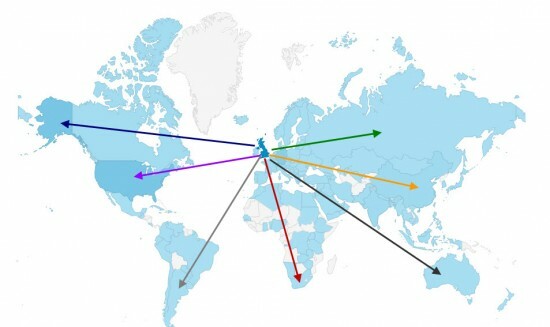 Where to find countries in Google Analytics. Firstly, it’s important to identify your potential markets. Even if you haven’t thought about developing your website to target more than one country, it will still be visible. This means that you may be getting traffic from other countries already. You can use google analytics to assess this, go to the ‘geo tab’ within the audience section. The easiest way of targeting a website for local audiences in other countries is to use your existing website to create a country or language specific page. Depending on size of your website, you could localise content on your site for multiple audiences in multiple countries. It is not always appropriate to recreate an entire website in a different language; this decision should be carefully thought out. There are two main types of website used to enhance International SEO, mainly depending on different language used by difference audiences in each target region. The first type is to build a multiregional website, designed to target users in different countries who all speak the same language. So, English in the UK, US and Australia or Spanish in Spain, Argentina, Chile, Columbia, etc. It’s not just the users who consider the URL structure of webpages but the search engines also, when making judgments about a sites relevance or authority. It can give users important information, an indication of content. It helps search engines catalogue the page within their index, and is one of the most important elements of international SEO. Researching Keywords needs to be done with help of a native speaker of each of your target languages. Initially, carry out research in English (or your own language) before it is translated and localised. More than often the direct keyword translation in not necessarily the most relevant to your content. You need make sure that a professional translates all keyword research. This is the process of adapting website content that has been translated into different languages to a specific country. The most obvious example is that most people in both the UK and USA speak English, however people in the UK do not refer to their trousers as ‘pants’. It’s vital to understand that words have different meanings across different countries and also regions. Once this is completed, you should get it double checked by a native speaker before the site goes live. A huge part of any SEO strategy is link building, this is no different with an international website. Building links from local sites is paramount to a successful website. Search engines will always prefer to see local links to each site rather than links coming from a different country. Promote your international website by obtaining links from relevant local sites and building relationships with local influencers and media. You should also identify what works best in each country by carrying out backlink analysis on sites performing well in each country. Ben Wood – Head of Digital at Hallam Internet. Previous Post Export Action Plan Competition Final (January 2016) – photos from the day Next Post Sustainability vs. Economic Growth: when fast economic growth becomes a double edged sword.